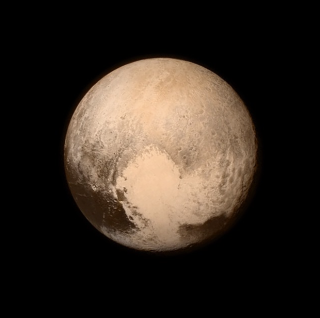 The New Horizons probe captured a sneak peak of gorgeous Pluto! According to the New Horizons social media team, this is the last and most detailed image of Pluto sent to Earth before the moment of closest approach - 7:49 a.m. EDT on July 14. The first age of solar system exploration is in the books. NASA's New Horizons probe flew by Pluto this morning (July 14), capturing history's first up-close looks at the far-flung world — if all went according to plan. (Mission team members won't declare success until they hear from New Horizons tonight.) Closest approach came at 7:49 a.m. EDT (1149 GMT), when the spacecraft whizzed within 7,800 miles (12,500 kilometers) of Pluto's frigid surface. To celebrate, NASA unveiled the latest photo of Pluto, showing a reddish world with a stunning heart-shaped feature on its face. After today's close encounter, all nine of the solar system's traditionally recognized planets have now been visited by a robotic spacecraft — a massive undertaking begun in 1962 when NASA's Mariner 2 probe zoomed past Venus. New Horizons is "a capstone mission," Glen Fountain, mission project manager from the Johns Hopkins University Applied Physics Laboratory in Laurel, Maryland, told Space.com. "It is the completion of this initial reconnaissance of our solar system. It's giving us a new perspective about how we as human beings fit into the universe." In a coincidence of cosmic proportions, today's close approach fell on the 50th anniversary of the first flyby of Mars, which NASA's Mariner 4 spacecraft executed on July 14, 1965. "You couldn't have written a script that was better," New Horizons principal investigator Alan Stern, of the Southwest Research Institute in Boulder, Colorado, told Space.com. There are no longer nine officially recognized planets, of course. The International Astronomical Union famously reclassified Pluto as a "dwarf planet" in 2006, in a decision that remains controversial today. Pluto was discovered in 1930 by American astronomer Clyde Tombaugh, and the dwarf planet has remained mysterious ever since. Because Pluto is relatively small and extremely far away — it orbits about 39 times farther from the sun than Earth does, on average — the object is a tough target for instruments on or near Earth. Indeed, the best images by NASA's iconic Hubble Space Telescope show the dwarf planet as merely a blur of pixels. Astronomers didn't know Pluto had any moons until 1978, when the dwarf planet's big satellite, Charon, was first spotted. At 750 miles (1,200 km) in diameter, Charon is about half as wide as Pluto itself. Furthermore, the two bodies' center of gravity lies outside the dwarf planet, so many researchers regard Pluto-Charon as a binary system. That close encounter has been a long time coming. The $723 million New Horizons mission launched in January 2006 but began taking shape in 1989, the same year NASA's Voyager 2 probe cruised past Neptune, getting the first up-close looks at the stunning, blue "ice giant." It took more than a decade of hard work and wrangling before New Horizons graduated from concept to full-fledged NASA mission. "It's an unusually tortured history," said Stern, who has been a driving force behind New Horizons from the very beginning. New Horizons "faced a crazy number of challenges — politically, funding and priority; nuclear fuel shortages; rocket issues," Stern added. "So many people stuck with this for so long. They got knocked down, they stood up. They got knocked down again, they stood up again. They would not take no for an answer." All that persistence apparently paid off this morning, when New Horizons hit its target nearly 3 billion miles (4.8 billion km) from Earth, a feat Fountain likened to sinking a hole-in-one on a golf shot from New York City to Los Angeles. Barring any unfortunate surprises, New Horizons is now studying the Pluto system up close with seven different science instruments, including cameras capable of picking out features on the dwarf planet's surface as small as the ponds in New York City's Central Park. The spacecraft's observations will help researchers map the surfaces of Pluto and Charon in detail; characterize the two bodies' geology; and shed light on Pluto's wispy, dynamic atmosphere, among other things. Researchers said they can't wait to get a look at the close-approach data. Their appetites have been whetted by observations gathered over the past few weeks showing that Pluto and Charon are complex worlds with surprisingly diverse surfaces. For example, Pluto sports a polar ice cap and a huge, bright, heart-shaped feature, as well as a giant dark patch mission scientists have dubbed "the whale." Charon, for its part, is scored by craters and canyons, and harbors an enigmatic, 200-mile-wide (320 km) dark blotch at its north pole. "The Pluto system is enchanting in its strangeness, its alien beauty," Stern said Monday (July 13) during a NASA news conference. "We are already seeing complex and nuanced surfaces that tell us of a history for these two bodies [Pluto and Charon] that is probably beyond our wildest dreams on the science team." Analyses suggest that dire outcome is extremely unlikely — but it's possible nonetheless. "Formally, we're able to set model limits at around 1 in 10,000 [odds] that the spacecraft will be lost due to a debris strike," Stern said during Monday's news conference. "But we've also been very honest that we're flying into the unknown. This is the risk you take with all kinds of exploration." The implications of New Horizons' discoveries should extend beyond the Pluto system, mission team members have said. After all, Pluto is just one of thousands of objects — albeit the largest and most famous one — in the Kuiper Belt, the largely unexplored ring of icy bodies beyond Neptune's orbit. "From the science perspective, we're entering this whole new realm of the solar system," former astronaut John Grunsfeld, associate administrator of NASA's Science Mission Directorate, said during Monday's briefing. Whatever happens with that potential extended mission, New Horizons will leave an impressive legacy, Stern said. "This is very special," he told Space.com, referring to today's flyby. "I'm a biased guy on this, but I think this'll be the space event of the decade." Space.com managing editor Tariq Malik contributed to this story from Laurel, Maryland. Follow Mike Wall on Twitter @michaeldwall and Google+. Follow us @Spacedotcom, Facebook or Google+. Originally published on Space.com.